Three Days Of Magic – Day One! But more than happy memories, Cornwall has something else. Every time I find myself up to my knees in cold salt water, or cycling into Padstow for a cornish pasty, it is so much more than just happy. I think it’s a bit magical. Which is why, when I found myself with a few days I was determined to take for myself, to get some writing done (who knew, finishing a show would mean you have less time on your hands?!?!) and to take some time to think over some of the things that are bothering me, or that I want to change in my life at the moment, I ended up down here. I needed some of the cornish magic. When we ended up spending so much time down here with my grandparents over the summer holidays, my parents also caught the bug, and ended up buying a gorgeous house, which they rent out (link and details at the end of this post). I had kinda assumed that it would be booked out on the first week of July, however, last minute – it was available this week. So this morning I got in my little blue car and zipped down the motorway. By 2.30 I was here, opening all the doors and letting the sunshine in! I am having three days down here and wanted to write about them and show you how gorgeous this wonderful place is and what I have been up to, and to let you in on the magic too. I’m a strong believer in taking time out by yourself, so I have 3 days here, completely by myself, to do whatever I want – and I’m loving it. So, I got here early afternoon and after some lunch on the balcony – looking out over the most gorgeous view ever – I decided I wanted to take a trip to the beach today. 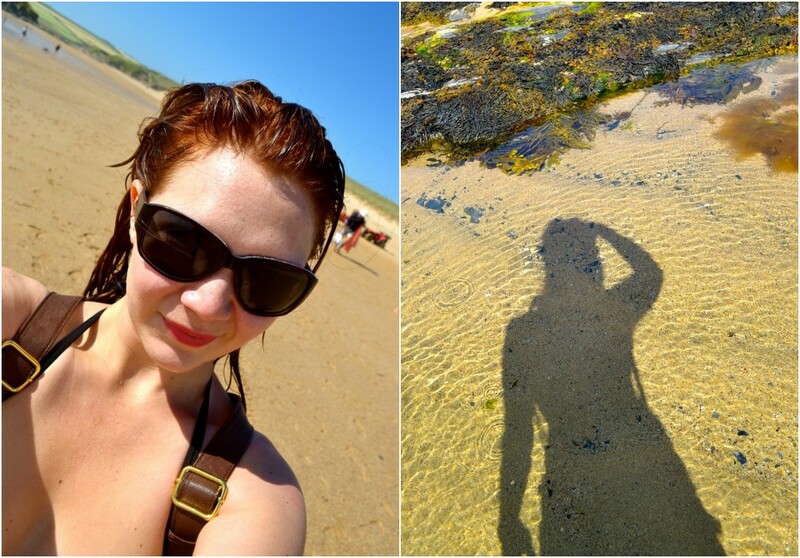 There are so many beaches within about 15 minutes of the house I simply picked one of my favourites, Constantine Bay, and popped my bikini on. I wasn’t going to go in the sea properly, just to have the option to get my kit off and sunbathe if I fancied it. Ooh, and I’m back to proper redhead again – Finally had the time to get my hair done again this week after being in London and super busy for so long! The beach itself is really long and beautiful and I walked the length of it, paddling and taking photos, climbing on the rocks and just taking it all in for about an hour. As I said, I wasn’t planning on going in to the water properly, but having paddled, the mad-woman that I am decided I wanted to and asked the lifeguards if they would watch my backpack for 3 minutes while I zipped into the water in just my bikini – no wetsuit! It wasn’t as cold as I thought it would be, but still chilly enough to knock the wind out of you for a second when you duck your head under! Brr! It might be because I have lost a bit of weight recently (still a curvy size 10 though!) or maybe because I’m here by myself, or even maybe I was just feeling really relaxed, but after my swim I collected my backpack from the lovely lifeguards – thanks guys – and walked the beach and the rocks for nearly another hour in just my bikini. I would NEVER have done that last summer. I don’t know what it is. I just felt really comfortable. No, I don’t have a perfect bikini body, my bottom wiggles and I don’t have a washboard tummy, but it felt fine. This was the spot I decided to sit down in – BEAUTIFUL! I sat in my bikini on a rock, looking out to sea, and had a post-swim apple – and I can honestly say I felt happier than I have felt in weeks, months even. I wasn’t thinking about anything. I wasn’t pondering the things I need to do, or the people I need to get back to (sorry if you are waiting for me to get in touch – I’m taking a mental sabbatical for a few days! ), or the decisions I need to make – I was just enjoying it. There are worse views to look at while you have a mid-pm snack! I’m back in the house now, looking out over the river at all the boats bobbing around on the water and the sun setting, and all I can think is “How can I ever leave?” I know reality is waiting – but couldn’t I just stay here forever? Look at the little birds flying over too – so beautiful! I’m now all showered, de-sanded and sea-salt free, planning on curling up with a good book for the evening – just had a fresh salmon steak for dinner with caesar salad – may possibly even have a quick dip in the hot tub at some point too; perfect. I really might never leave. I will be posting again tomorrow – so check back for the next day in my little paradise – this is also to make up for lack of posts over the last month or so; it’s been unexplainably busy but I intent on posting at least twice a week over the next few months at least! A lot of people are scared to spend any time by themselves – I find it really therapeutic. It was just what I needed! It's been perfect – I had such a good time and a real recharge – just what I needed! Have fun in Falmouth; beautiful place to visit! You are living there?!?! You are lucky! I would so love to live down there – yeah, make the most of it all! I would kill to be able to drive to the beach on an evening and just watch the waves and think things through. Thank you – we love the house – I'm back down again in 2 weeks and I cannot wait!